Tattoos have definitely increased in popularity over the last few years, but who would have thought that even the ancient Egyptians had them? They did indeed, although they probably didn’t just walk into a tattoo parlor and request what they thought was cool. And for as long there have been tattoos, there has been tattoo removal. Peeling off several layers of skin until you can no longer see your tattoo hardly sounds like a good time. Yet that is exactly what people who wanted to get rid of a tattoo had to endure. Not only was there no guarantee of complete tattoo removal, but this crude process could also leave permanent scars and infections that could kill. Is it any wonder people thought keeping the tattoo was better than subjecting themselves to ridiculous risks? The next treatments for tattoo removal included applying chemicals to the skin, surgery, dermabrasion, and other tactics considered primitive today. While somewhat more successful than their predecessor, the risks still remained too high in relation to the benefit so most people ended up keeping their unwanted tattoos. By the early 1980s, people in the tattoo removal industry began to figure out that maybe laser technology was the way to go. The introduction of the Q-switched laser generated much excitement because it broke up ink by sending light bursts to the skin – a much less invasive way to remove unwanted tattoos! The fact that pulses of energy came in one billionth of a second (also known as a nanosecond) was amazing as well. However, concerns persisted about how long it took to erase a tattoo with the Q-switched laser and the safety of using it. While uncommon, the laser could discolor or burn the skin. Today, you can have the best of the both worlds. enlighten is a new form of laser technology that combines the nanosecond pulse with the picosecond pulse for truly customized results. If you thought a nanosecond was amazingly fast, consider that a picosecond is a trillionth of a second. The dual wavelengths and pulse durations make it possible to eliminate your tattoo in fewer sessions and with less discomfort than earlier forms of tattoo removal. At Vivid Tattoo Removal, we are proud to offer our patients the enlighten laser. If you’d like to learn more about making your tattoo history with enlighten, click here to schedule your free consultation. 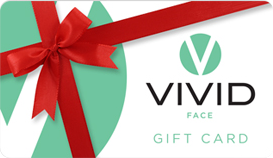 Vivid Face is a pioneer in laser technology and is an affiliate of North Beach Vascular & Aesthetics.